What’s Up With the Beach Curfew? Recent rumblings about the illegal Venice Beach and Ocean Front Walk closure. 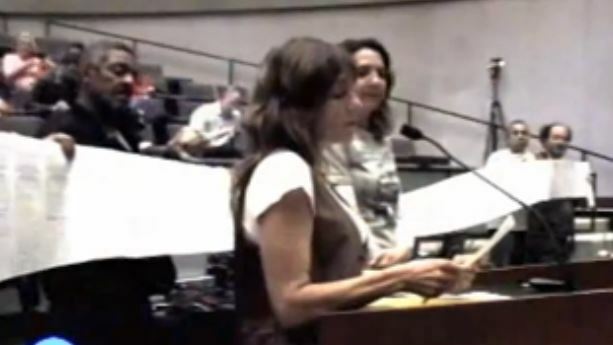 On March 13, 2014 a coalition consisting of the Los Angeles Community Action Network (LACAN), Occupy Venice and the Venice Justice Committee appeared before the California Coastal Commission meeting in Long Beach regarding the City of Los Angeles’ Illegal curfew law enforced on Venice Beach and Boardwalk (Ocean Front Walk). Why is it an illegal curfew law? Because according to the California Constitution and the California Coastal Act, no beach can be closed without first obtaining a Coastal Development Permit (CDP) from the Coastal Commission. This is State law, which a City has to comply with. And LA has not. Opposing this LA City beach curfew law is not a new effort. The first complaint was filed in November 2007, when the Venice Justice Committee discovered that the City had closed the beach without a CDP. They are State law breakers. Even more egregious to denying us all our right to access of the beach, the City was arresting people with this illegal law. That is why the effort to oppose this law became part of a local Homeless Bill of Rights campaign. Further to this, a comment was published regarding the illegal beach closed matter in a Coastal Commission staff report June 2013 (on a somewhat separate matter) that created more urgency with the issue. The terms of amending this law, without any recognition that the law itself is a violation, were being negotiated between Coastal Commission staff and the City. 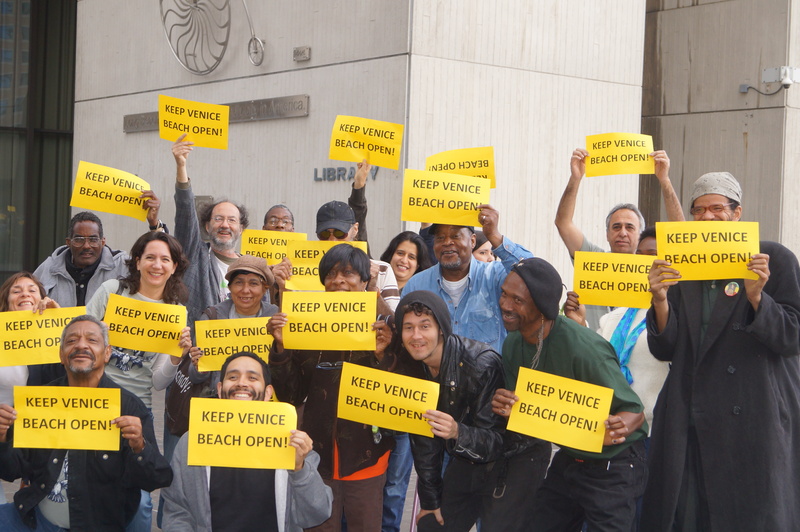 The coalition of Occupy Venice, the Venice Justice Committee, and LACAN collected almost 1,000 recent signatures by hand on a petition to open the beach. Copies of the petitions were taped together into a scroll that doubled across the room and up the stairs behind the three speakers’ presentation given in the March 13 Coastal Commission meeting during general public comment. It was so compelling, the Commission instructed staff to act on this enforcement issue and to report back at the April 2014 Commission meeting. See http://youtu.be/wIP4vTAn_aM for the excerpt of the meeting. Unfortunately, Coastal Commissioners instructing its staff to act on the matter also is not new. Since the original November 2007 complain was submitted, multiple other complaints or mentions of this violation have been submitted to the California Coastal Commission. 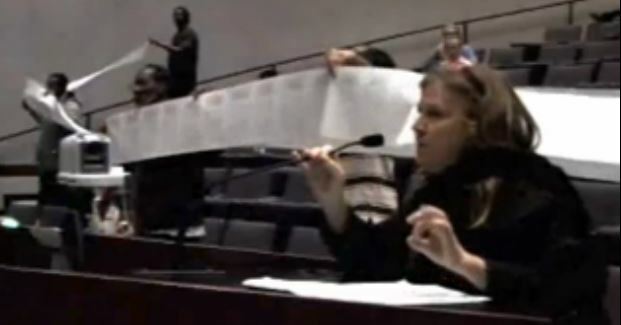 The past Commission Chair, Sara Wan, instructed staff to act on the matter in 2009. Lawyers defending criminalized homeless people in 2010 urged for Coastal Commission enforcement to act. Multiple letters from the Coastal Commission staff enforcement person were sent to the LA City Attorney in 2010. The prior and now deceased Executive Director of the Coastal Commission, Peter Douglas, then wrote a serious four page letter dated August 2010 inferring that further action was at hand, which would be a cease and desist order issued. That is what we asked the Coastal Commission for March 13, 2014 – a Cease and Desist Order. What happened was a weak conciliatory letter sent in April 2014 to the LA Department of Recreation and Parks. Why was it weak? The law is illegal and prior letters were submitted to the City Attorney demanding action. These prior letters were not lost. We just gave copies to staff and the Commission. The letter offered mitigation solutions to an unproven reason for closing the beach. No beach can be closed, with or without mitigations and with or without proof of a public safety reason, prior to first obtaining a CDP. (Period) The law is a violation of the California Constitution and the Coastal Act. So here we are. I suppose one important part of the story I haven’t mentioned so far is how the City decided the beach curfew should also pertain to the Venice Boardwalk (Ocean Front Walk) in March 2012. These are two different lands: Venice Beach and Ocean Front Walk. Ocean Front Walk was deeded as a forever sidewalk by Abbot Kinney. It is also a walk street and a Boardwalk. Venice Beach, not to be confused with using the term to describe the whole of Venice, is the area west of Ocean Front Walk. This leads to the other important and final part of this story: this is about criminalizing homeless people. The City of LA wanted to squirm out of following the Jones Settlement, which allows homeless people to sleep on sidewalks between 9pm and 6am. They were already unjustly arresting and criminalizing people for being on the beach after midnight so they just arbitrarily moved the illegal beach curfew law to include Ocean Front Walk. That’s our city. So much law enforcement, so little solutions. When will this change? Our not-so-progressive City Councilman for Venice (Council District 11) apparently wants the Beach and Ocean Front Walk to stay closed. He is also in favor of thinly veiled homeless sweeps called “clean ups” that cost untold tax dollars to spray bleach, confiscate belongings and harass homeless people. If someone reading this doesn’t care about human rights, look at the fact that actual solutions cost far less than using law enforcement to criminalize or harass homeless people. The latest fake beach “clean up” had thirteen vehicles along with city staff from the LAPD, Department of Sanitation, Hazardous Waste, and others. Yet there are no emergency shelter beds in Venice, extremely limited sanitary facilities (none at night and nothing near what’s required for the amount of tourist activity in Venice), and the voluntary storage for homeless belongings is over capacity. Los Angeles, still the shameless Homeless Capital of the United States, really needs to find a more humanitarian approach. A genuinely compassionate outreach to help poor and unhoused people would ease this tension created by the City of Los Angeles.